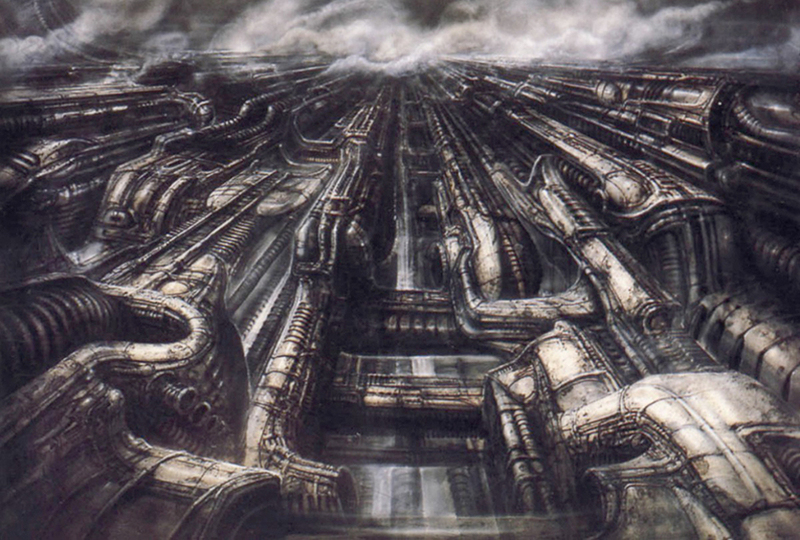 Giger's Pyschedelic Landscape and Biomechanical Landscape I ? The painting Biomechanic Landscape I (work 583) looks as if it ought to be a further exploration of to the Biomechanic Landscape III (train station) from 1979. Perhaps it also might make someone loosely think of the highly complicated Hades landscape from the 1982 Ridley Scott movie Blade Runner or perhaps the Harkonnen's Giedi Prime landscape from David Lynch's 1984 movie Dune, and environment that Giger was hoping to design for Alexandro Jodorowksy's failed Dune project. 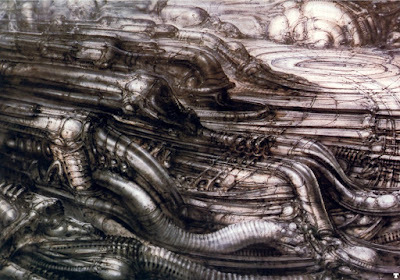 b.i) A scene from The Eternals featuring fire engines rushing along side each other down a wide road, become biomechanised as a biomechanic landscape. The fire engine on the central left with the fireman standing on the back becomes the centre of the painting. All the lines representing speed behind the fire engines become solid forms, the firemen's hats become merged or absorbed into with the biomechanic structure. The roof of the fire engine becomes transformed into bridges stretching across the central trench like form. 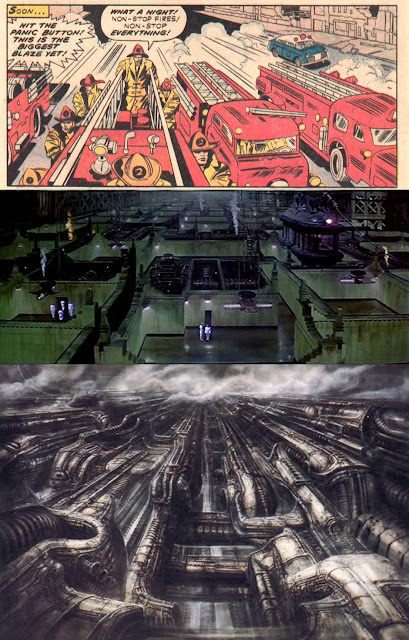 Perhaps it looks strangely near enough like the structure of the Giedi Prime environment with the tram being replaced by the police car. The fireman's hat becomes merged with the cabin of the fire engine on the right, becoming one elongated biomechanic formation. 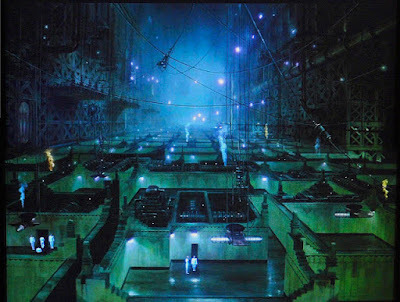 The fixtures sticking out of the top of the roof with the line connecting them become parts of the merged as features in the organic growth. The long rods on the roof of the central right fire engine serve a line to cut into the surface of the biomechanised version of it to reveal the ribbing inside. The fireman's hat seen in the detail becomes merged with the vehicle, conforming to the shape of a wall in the Giedi Prime environment. On the right, another fireman's hat stretches and merges with a fireengine. The cylindrical shapes in the back become the large ribbed pipe. The structures on the side of the vehicle, perhaps along with the wheel and the badge on emblem on the front of the upper fireman's hat becomes ribbing with tubular openings. c) Later referenced in the preliminary model for the Sakaar cityscape in Thor: Ragnorak?